These Bloomin’ Cinnamon Rolls are full of ooey, gooey caramel goodness. 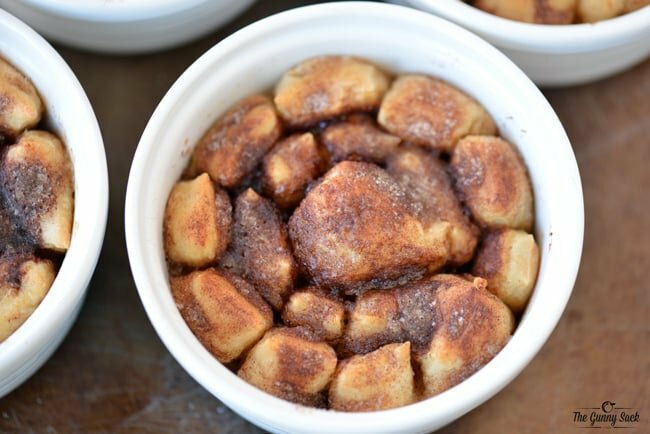 Make this blooming cinnamon roll monkey bread like recipe for breakfast or dessert. 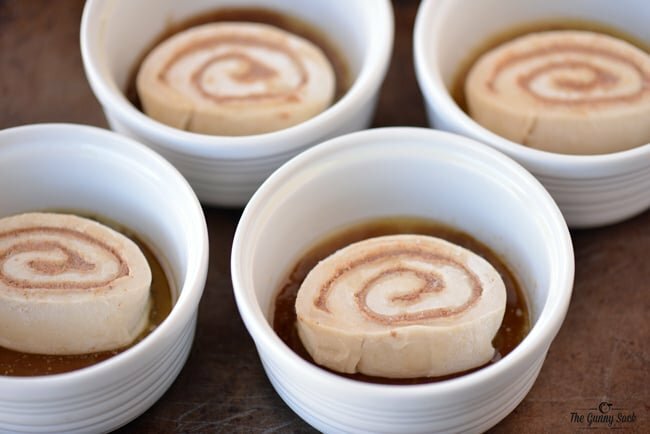 Cinnamon rolls of one of the desserts that bring me back to my childhood. My mom has always made the most amazing cinnamon rolls. 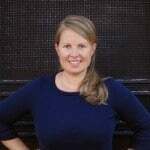 She makes pans of big fluffy cinnamon rolls, sticky caramel rolls, cinnamon roll loaves and cinnamon sticks. 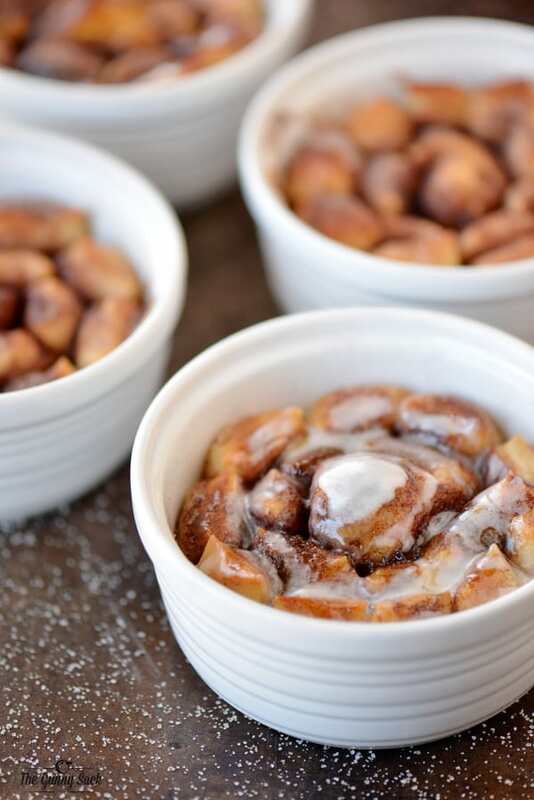 I remember one time when I was little, my mom had just pulled a pan of caramel cinnamon rolls out of the oven and had me run one over to our elderly neighbor’s house so she could enjoy them too! Today’s Bloomin’ Cinnamon Rolls recipe reminds me of those delicious caramel rolls. Like the Bloomin’ Baked Apples and Bloomin’ Baked Potatoes, these Bloomin’ Cinnamon Rolls are sure to become a family favorite! Start by preheating the oven to 170 degrees. Then, melt one tablespoon of butter in four ramekins (7 or 8 ounce size) and add a tablespoon of brown sugar. Mix the brown sugar and the butter together. Top the mixture with a frozen cinnamon roll. Place the ramekins on a baking sheet. Turn the oven OFF (this is very important because you don’t want the cinnamon rolls to bake yet) and put the frozen cinnamon rolls in the oven to rise for about 1 1/2 hours. Remove the pan from the oven and preheat it to 350 degrees. 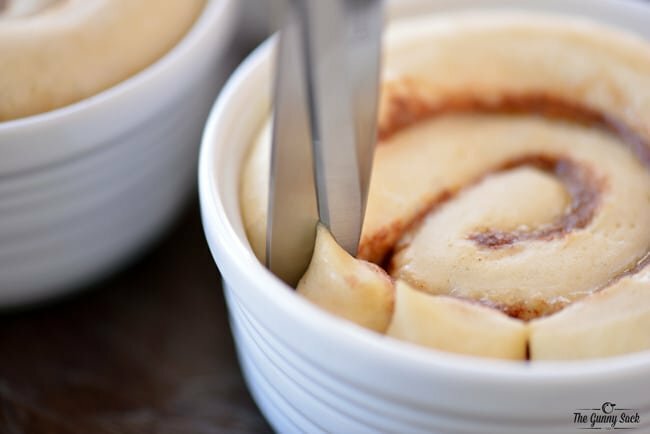 Use a pair of kitchen scissors to make cuts around the cinnamon roll (the cuts don’t have to go all of the way through). Leave the center uncut. Mix together two tablespoons of granulated sugar and one teaspoon of cinnamon. Sprinkle one teaspoon of the mixture over each of the cut cinnamon rolls. Bake the bloomin’ cinnamon rolls at 350 degrees for 15-20 minutes. Then, drizzle the cinnamon rolls with one teaspoon of caramel ice cream topping. 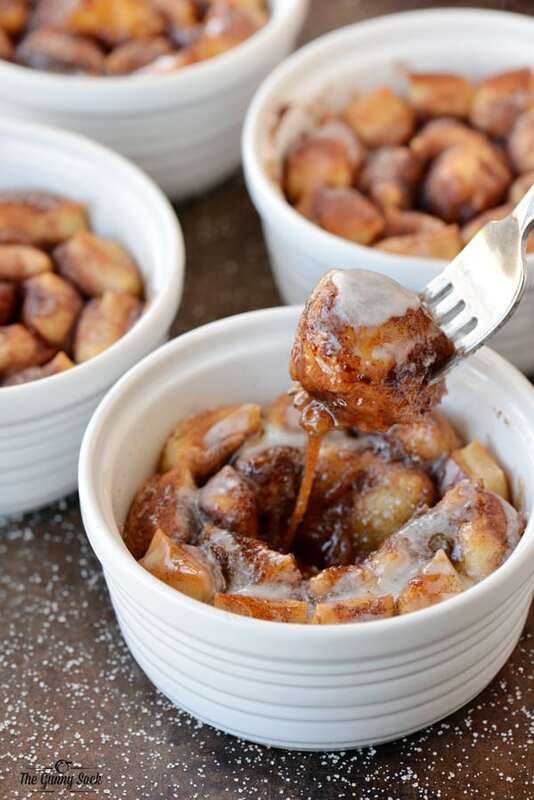 It’s like an individual serving of caramel monkey bread! Mix together two tablespoons of softened butter, one cup of powdered sugar, two tablespoons of milk and half of a teaspoon of vanilla. Drizzle the icing over the blooming cinnamon rolls. 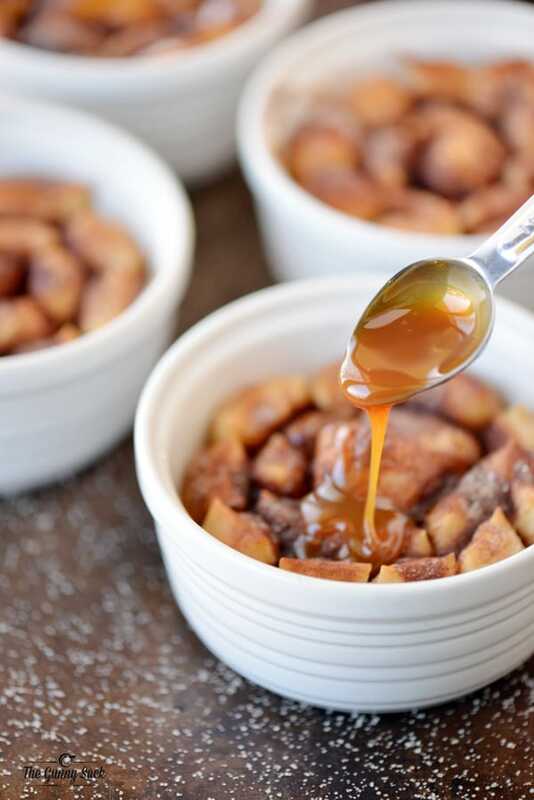 Take an ooey, gooey, caramel-ey bite. The bottom has a delicious layer of caramel just waiting to be scooped up! 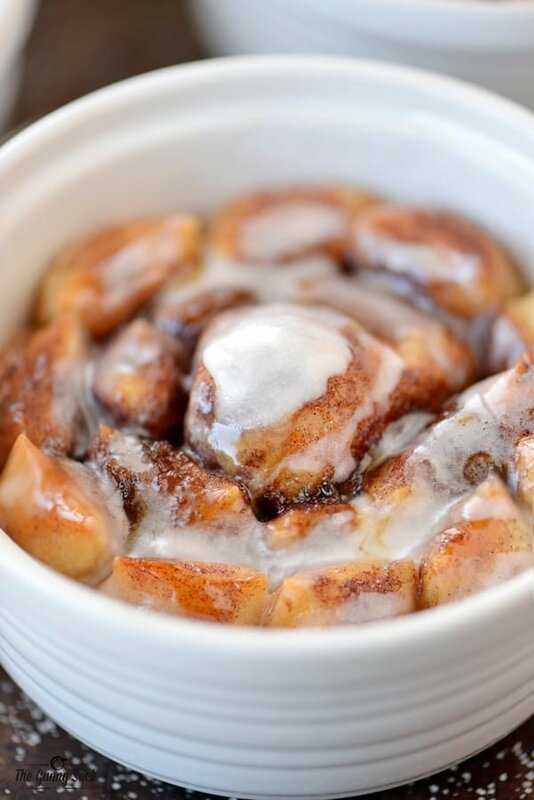 There’s nothing quite like a warm cinnamon roll. These Bloomin’ Cinnamon Rolls are comfort food at its best. 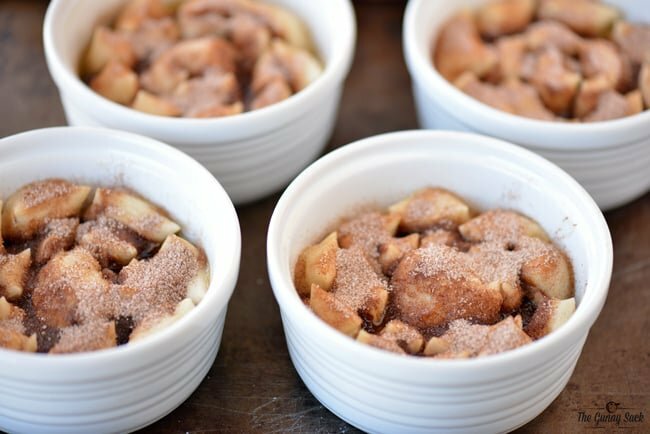 Try making them for dessert or as part of a special breakfast! Grease ramekins with cooking spray. 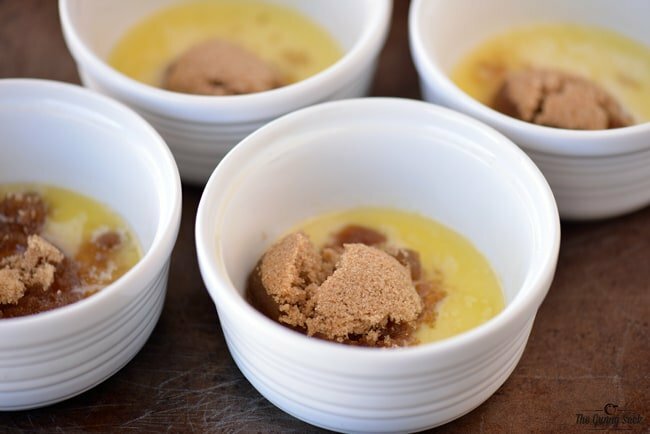 Melt one tablespoon of butter in four ramekins (7 or 8 ounce size) and add a tablespoon of brown sugar. Mix the brown sugar and the butter together. Top the mixture with a frozen cinnamon roll. Turn the oven OFF (this is very important because you don’t want the cinnamon rolls to bake yet) and put the frozen cinnamon rolls in the oven to rise for about 1 1/2 hours. Remove the pan from the oven and preheat it to 350 degrees. Use a pair of kitchen scissors to make cuts around the cinnamon roll (the cuts don't have to go all of the way through). Leave the center uncut. Drizzle the cinnamon rolls with one teaspoon of caramel ice cream topping. These are so fun and they look so gooey and delicious! Yum! Thanks so much Eden! I wish I was having one right now! 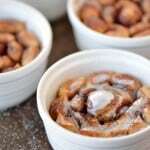 If someone wanted to add some toasted pecans when would you do it? I dont know where to buy frozen cinnamon rolls in Canada. Could i use pilsbury cinnamon rolls instead? Pillsbury Cinnamon Rolls and like the other person asked can we use them. In Canada I believe we can buy Rhodes frozen dinner rolls only – at least we could at one time. Oh wow.. These look beyond amazing! Thanks for sharing! Tonia, this is the most brilliant thing I’ve seen lately! I love the idea of a bloomin’ cinnamon roll – I mean, who wouldn’t?! Pinned!! Would someone please give me an example of frozen cinnamon rolls? I’ve only ever seen the canned ones in the refrigerated section of the store. Thank You! I used Rhondes Cinnamon Rolls http://www.rhodesbread.com/products/view/cinnamon-rolls There is a product locator on their website. Some stores might also sell a store brand of frozen cinnamon rolls. 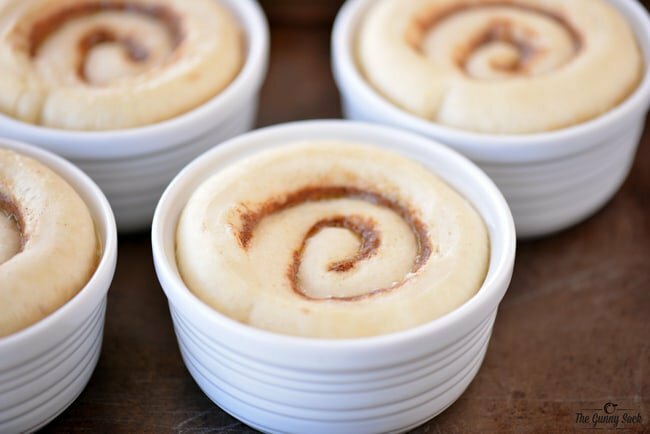 You could also use a small batch of homemade cinnamon rolls, just let them raise in the ramekins. Best of luck! Our grocery store has frozen cinnamon rolls with 12 in a bag.